I had no idea how great my need for parenting encouragement was until this past weekend. I realized that there are times we give and give; do and do forgetting to replenish ourselves along the way. This eventually leads to burnout and possible feelings of bitterness. Thus, find those things that fill you so you can continue to pour into others knowing this is a balancing act. For the last 10 years I have attended “The Wholehearted Mother” conference held in the Dallas/Fort Worth area. I have missed a few but not many. I consider this time my vitamin B12 shot for a balanced mothering perspective. Unbeknownst to Sally Clarkson, she has been one of my greatest mentors as she has a beautiful heart that seeks to know HIM and shares her joys, sorrows, struggles, life, etc… which I can totally relate to. I recall first hearing her speak in CA in 1996 at a home school conference where my desire to home educate solidified and became achievable as I too desired to raise our children in the training and instruction of the Lord. What a joy it has been to shape our girls hearts to be followers of Christ. Today we are seeing some fruits of our labor as both older girls love God, are passionate about Him and serve Him. When we moved to Austin in 1998 and I was able to hear Sally share “Educating the Wholehearted Child.” Ok I feel like a groupie as I made it a yearly commitment to get my dose of encouragement as it related to being a better mother and wife. Over the years she has brought in other speakers such a Linda Dillow, Jean Fleming, Zan Tyler, and her daughter. I guess I share this as the role of having Godly (wise) mentors in your life is invaluable and it looks different for each of us. It’s best to have someone you can meet face to face however with our many moves, home schooling of the girls, the added blessing of Cayley, life, etc.. I found it easier to run to a (conference, book, my past notes) when I needed a little perspective on life not to mention encouragement. The conference this weekend was titled “Seasons of a Mothers Heart” after her revised and updated book; which I recommend for those looking for a dose of mothering encouragement. I enjoyed how she related the various seasons and changes to our lives as mothers as I am visual. I know you have heard it said, “before you know it, your baby will be grown.” It is true and each stage of life is a season. Use your time wisely and know where you are going. She began with SUMMER being a time of RESPONSE. This is a time to plant when we as mothers want to reach our children’s hearts. To be a planter we must invest our time (mentor). This investment of time and mentoring has been very intentional with Caryn and Courtney who we desired to know God, be like Him, and serve Him. I realized this weekend that when Cayley came into our lives I was not as intentional about what the end would look like for her given the 10 year gap and the urgency to finish well with our big girls. Hence the need for my attending the conference as I desire to clearly define our vision for Cayley’s life. It is imperative to know where you are going as you will end up somewhere. We sought God’s word in helping us develop our road map as parents. I can’t give my girls (others) what I do not have and my help comes from the Lord. I implore you to spend daily time in the word. A little adds up over time. One of my favorite ways to fill/renew my mind with truth is listening to the bible on CD at bedtime. It is calming and peaceful to fall asleep to truth renewing your mind. Be sure you attend a bible teaching church. Carefully pray about the various activities you and your children will be involved in. If you want to make family meal time a priority you might have to say no to other things. Live your live intentionally. Next is FALL a season of RESOLVE sort of where you adjust your expectations, reassess, stand back and gain perspective. Currently this is one place God has me with all three of the girls. My expectations have to change now that the older girls have their own schedules (college and work) and we have ours. We aren’t all able to have a consistent breakfast or dinner time together. Connecting with the older girls has to be more intention on my part when they are open and available. Cayley is growing up in a very different decade than her older sisters. How I did things in the past require me to reevaluate them today. Throw in ministry opportunities, real life, and my bent to be organized and wanting do it all = burnout. Guess what? I can’t do it all and especially well. This is when I tend to fall into many feelings of self condemnation as I allow others opinions/suggestions/request to matter more to me than that of my family. Thus, I resolve 1) to step back reevaluate what all is on my plate and be sure my priorities are right (God, Jon, the girls, and then other things); and 2) to let go of many of the expectations I have placed on the older girls and our family. I am thankful for new beginning and knowing it is never to late to start afresh in the grace I am given by my heavenly Father. Coming soon part two ( WINTER and SPRING) insight. As many of you know, these past several years have been full of ups and downs for us. When Jon and I married I would have never imagined him starting a company. He is full of incredible ideas and it would have been sad for him to wonder if he had what it took to start a company – thus Bones in Motion began 2003. I was recently asked if I could have looked into a crystal ball to see the future would I have chosen the path we are on knowing the long laborious road it has turned out to be? Without a doubt I replied YES as I have learned so much about the character and goodness of God through the process. When Jon’s company recently needed specific prayers, I went before the Lord with hands held wide open. God was faithful to encourage me with the following and I trust if you too are facing a difficult situation you will find encouargement. Last night (2/12/08) as I lay in bed I searched through God’s word for truth and encouragement that I could pass your way. Do know you are being covered today in prayer. James 5:11 As you know, we consider blessed, those who have persevered. You have heard of Job’s perseverance and have seen what the Lord finally brought about. The Lord is full of compassion and mercy. You can see the importance of http://thewerners.org/?search=viagra-mail-order perseverance from above scripture that credits Job and the below short account I read in a devotional shows the need for see url perspective. “Dear wife, it is your grief that speaks such hopeless words. God is with us still, ” Job consoled. “Trusting Him makes you the fool,” she cried. “Though HE slay me, Yet will I hope in Him.” Job stood his ground. Job endured because he trusted that source God had a perspective on the situation that he could not see. And Job was right! It was satan, not the Lord, who had put him to the test. In time, everything was restored to Job- twice as much as before. He lived a long life because he persevered in hope. Remember their is no greater testimony to the faithfulness of God than trusting Him in the face of all the heartache. Your perseverance will pay off. Father God I do pray that today __________ will feel your comfort and strength in all they say and do. May they experience the unlimited resources of your mighty strength offered though the Holy Spirit. Mark 9:24 “I do believe, help me overcome my unbelief.” Since faith is never perfect, and belief and unbelief are often mixed this is a great prayer. 2 Thes. 2:16-17 NLT May the Lord Jesus Christ and God our Father, who loved us and in has special favor gave us everlasting comfort and good hope, comfort your hearts and give you strength in every good thing you do and say. Eph. 3:16 I pray that from his glorious, unlimited resources he will give you mighty inner strength through his Holy Spirit. Rm 8:26-27 TLB The Holy Spirit helps us with our daily problems and in our praying. For we don’t even know what we should pray for, nor how to pray as we should; but the Holy Spirit … pleads for us in harmony with God’s own will. Matt. 11:29-30 Jesus said, “take my yoke upon you, and learn from me; for I am gentle and humble in heart, and you will find rest for your souls. For my yoke is easy, and my burden light. Rm 15:13 RSV May the God of hope fill you with all joy and peace in believing, so that by the power of the Holy Spirit you may abound in hope. Phil. 4:6-7 NLT Don’t worry about anything; instead, pray about everything; tell God your needs, and don’t forget to thank him for his answers. If you do this you will experience God’s peace, which is far more wonderful than the human mind can understand. His peace will keep your thoughts and your hearts quiet and at rest as you trust in Christ Jesus. Prov. 10:28 RSV The hope of the righteous ends in gladness. Isaiah 41:10; 13 NLT Don’t be afraid, for I am with you. Do not be dismayed, for I am your God. I will strengthen you. I will help you. I will uphold you with my victorious hand. I am the Lord, your God, who takes hold of your right hand and say to you. Do not fear; I will help you. 2 Tim 1:7 God has not given us a spirit of fear but of power and of love and of a sound mind. Ps 32:8 I will instruct you and teach you in the way you should go; I will counsel you and watch over you. Heavenly Father, we have become tired and disappointed in the midst of the many difficult circumstances and disappointments related to _______ and our own financial hardships. Our patience is exhausted and I’m tempted to be angry with you, others, and myself. Giving up becomes more of a prospect. Help us to http://cinziamazzamakeup.com/?x=farmacia-viagra-generico-200-mg-a-Napoli persevere through this lean and uncertain time. We want to hold on, but there seems to be less to hang on to. Waiting and keeping my focus on You can be so hard at times. My mind wanders, replaying imagined outcomes of “If Onlys” and “What Ifs”. I know you have the answers, and I need to rest in Your peace. Keep my mind grounded in your truths and to have a Job perspective. I am fearful of heights. In January Jon and I attended a retreat with several teachers from our church (Austin Stone Community Church). 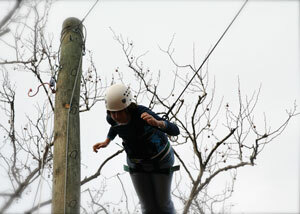 Part of the day on Saturday was spent doing group team building exercises on a ropes course. What happens when you have a group of teacher/leaders together? You quickly learned if you want to succeed as a group that having to many chiefs creates chaos and confusion. Also good communication is important for success. The last task was optional and my personal challenge (as I fear heights). I was quickly hoisted toward the top of a pole about 40 feet up by those on the ground. I held in my hand a rope that determined when I would fall. I held onto this rope tightly with both hands as a begged to be let down for several minutes. Why was I terrified even though 10 people had done this before me with enthusiasm? Did I mention that they were all much younger and many without children? It’s crazy what fear does to our minds. Remember earlier I mentioned that this was about team building. As I was whining for them to let me down they were encouraging and cheering me on. viagra generico 100 mg spedizione veloce a Firenze Therefore encourage one another and build each other up, just as in fact you are doing. 1 Thess. 5:11 Left to myself I would not have let go of the rope but being spurred on by the others I eventually had to let go. I will not lie as it was crazy free falling like that but by the second swing WOW! it was exhilarating and then even peaceful swinging around. However, once was enough for me. This made me think about the many things people hold tightly onto (relationships, money, job security, children, etc.) As a parent of three girls (19, 17, and almost 7) thankfully many years ago Jon and I came to understand that our children were temporary gifts from God. They did not belong to us rather were on loan to us from God and we would eventually have to let them go. The more you trust and pray for God’s involvement in your child’s life, the less possessive and reluctant you will be to release them into His hands. For me I have had to let go on many fronts already and am still learning to http://cinziamazzamakeup.com/?x=cialis-generico-affidabile l http://cinziamazzamakeup.com/?x=quanto-costa-viagra-generico-100-mg-online-a-Milano et go of seeing my child as an extension of myself; go here Let go of the desire to control her; watch Let go of my expectations for my children; http://cinziamazzamakeup.com/?x=prezzo-viagra-generico-200-mg-pagamento-online-a-Milano Let go of rescuing them from failure; Let go of my need to be appreciated (this is the hardest for me); Thankfully letting go is a gradual process and we are given many opportunities to practice from their first baby steps, going off to Kindergarten, getting their drivers license, graduating from high school, going to Africa for 6 months, college, etc… I know I can let go because they belong to Him and that gives me great peace. Below is a poem I came across in “Give Them Wings” by Carol Kuykendall. May you be encouraged. To let go doesn’t mean to stop caring, it means I can’t do it for someone else. To let go is not to cut myself off,it’s the realization that I can’t control another. To let go is not to try to change or blame another; I can only change myself. To let go is not to be in the middle arranging all the outcomes, but to allow others to effect their own outcomes. To let go is not to deny but accept. To let go is not to nag, scold, or argue, but to search out my own shortcomings and to correct them. To let go is not to adjust everything to my desires, but to take each day as it comes. To let go is not to criticize and regulate anyone, but to try to become what I dream I can be. To let go is not to regret the past, but to grow and live for the future.